This week I thought I'd share some of the things I've been grateful for over the last week, things that have brightened my day, and that I've documented in photos over on my Instagram account. This week I have been mostly grateful for coffee and good friends! I honestly don't know how I would get by without it or them. With more teeth on the horizon for Miss Dot and the general exhaustion of daily life at the moment I am surviving purely on caffeine! 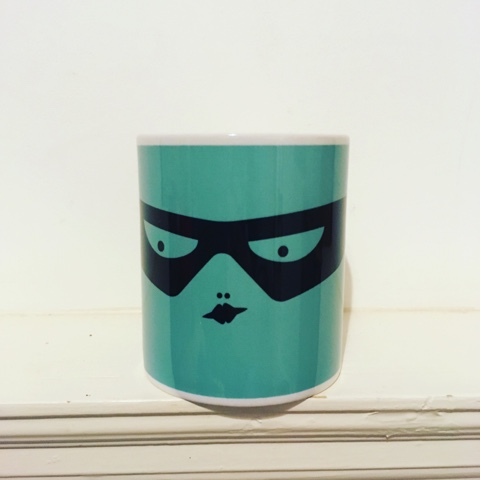 A very dear and totally awesome friend gave me this mug last week which I have taken to work and it really makes me smile whenever I drink from it and it has reminded me of a mama's superpower - keeping going because we have the best reason ever to do so. Raising a mug to all the other tired mamas out there! Cheers! After some grey days there have been some beautiful winter days this week, cold and frosty but with bright blue skies and sunshine. 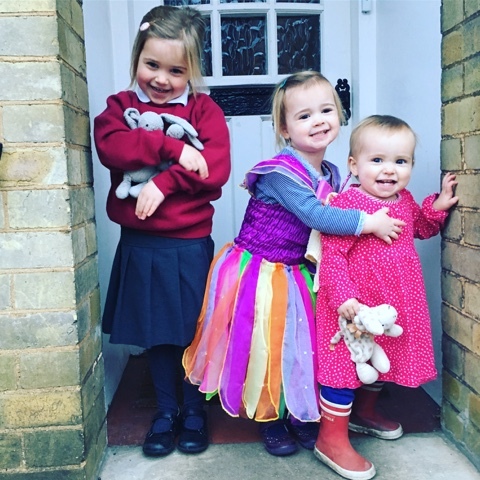 It's really given us all a spring in our step as we head to school/playschool/work and I'm super grateful for it because the alternative is just no fun at all, particularly on the school run! Miss Tibs loves the sparkly grass covered in frost and the way it crunches under her feet. I love how children notice these things; it's one of the most magical things about being a parent I think, seeing the world again through fresh eyes. I was going to save this next photo for this months Sibling Project post... It's not the best quality photo by any means but it captures a moment between my children that I am so grateful for. I'm so grateful to be their mummy, I'm so grateful for the love they have for each other and how they without fail make me smile every day and my heart leap. I took this one bedtime this week as they were saying goodnight to each other. Bedtimes can be hard especially as I usually undertake at least 4 solo but this is just such a nice way to end the day before I make my way downstairs to clear up the day's chaos and makes any struggles so very worth it. I often pop back up and check on them once they are asleep and love seeing them asleep so peacefully. Sometimes having rushed them into bed because I am tired and I have so much to do I want to scoop them up and wake them up and hear their little voices and the sound of their laughter. Any challenging moments from the day are forgotten and forgiven and they look like little angels, so along with the bedtime cuddles i'm grateful for bedtimes! Reminding myself of the ordinary things and moments I am grateful for has been such a lovely thing to reflect on this week. What are you grateful for this week? I'd love to hear, do share in the comments below. 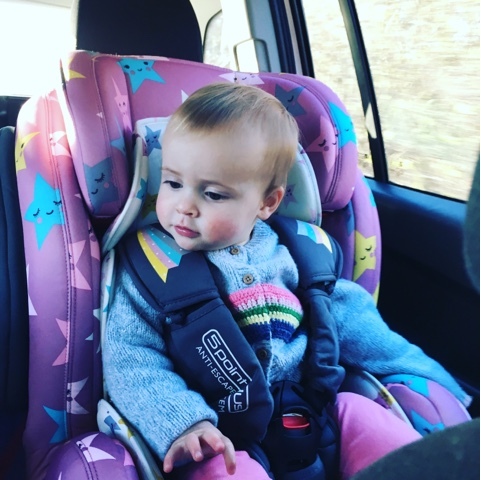 At 17 months it's time for Miss Dot to make the move from her baby car seat to the next stage up. Our trusty baby seat has served us so well protecting all 3 of the little ladies from their first journey home from the hospital and pretty much every day since for the last five years, I couldn't help but feel a little sentimental about Miss Dot growing out of it. 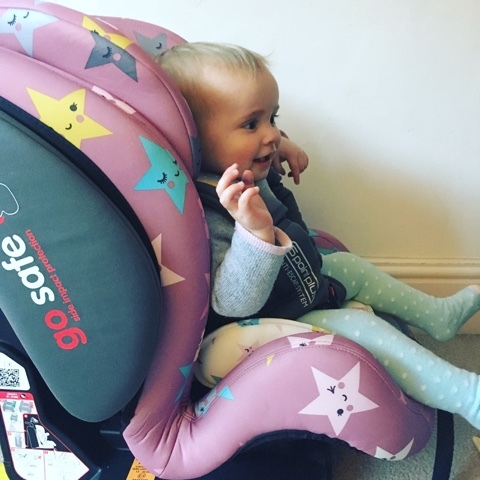 Cosatto have thought of everything when it comes to safety with this car seat which includes outstanding safety features such as their 'go safe' side impact protection. The headrests are incredible offering lots of support and cushioning. 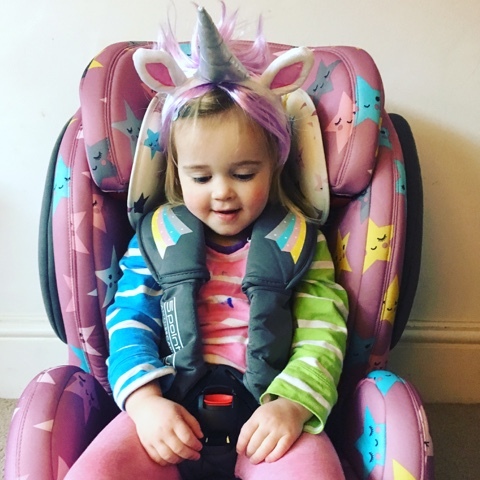 Little ones arms are protected to with the comfy padded arm rests and are sure to remain safely strapped in with and exclusive 5 point safety harness complete with anti escape system to stop them wriggling free. 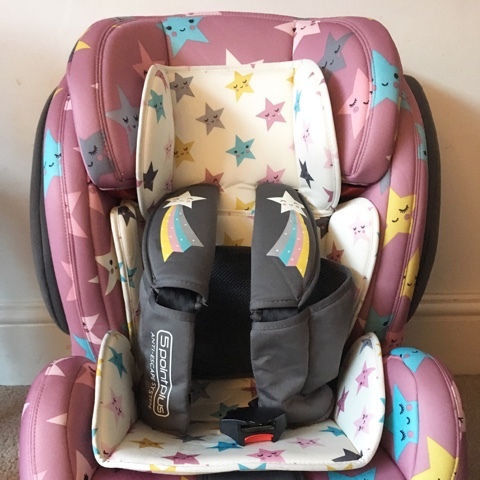 It has a quick release button to get your child in and out their seat which is not only great for safety but for convenience too. Miss Dot is so well cushioned and protected with the side impact bar, headrests and arm rests. It comes with universal Isofix fittings making it super easy to dock in your car and so secure when installed giving you great piece of mind. There are easy to follow instructions on the side of the seat should you need a reminder. 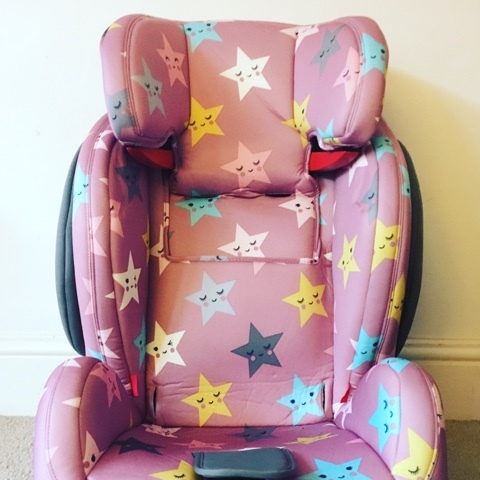 I love that once transformed into a stage 3 booster it can still be secured using the Isofix for extra stability as often booster seats don't feel very steady. It also has a seatbelt safety clip to keep the strap positioned correctly and securely across your child's chest. You can fit this seat into your car at all stages using a seatbelt should you ever switch it into an older car which doesn't have Isofix. 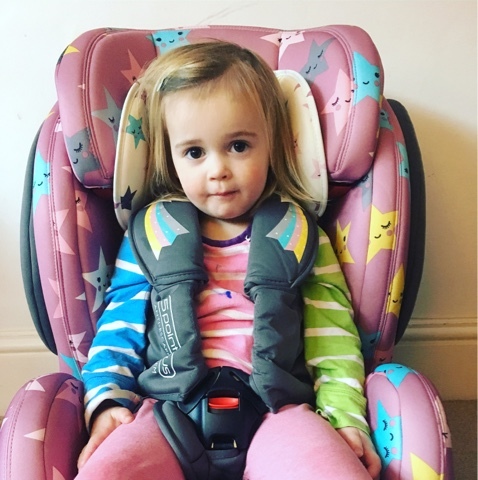 The car seat is made from such high quality materials which are really, soft, comfy and padded which feel really luxurious, Miss Dot absolutely loves sitting in hers! The seat pad and covers are easily removable making it easy to clean should you need to. The Hug also comes with a 4 year guarantee which I think is testimony to Cosatto's confidence in their product and I have no doubt that ours will be in great condition long after this. 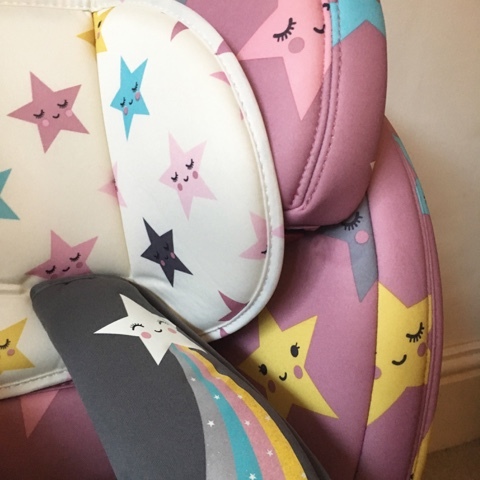 Finally the seat looks great, it's so fun and the girls were so keen to get in it, which when trying to get out the door on time for things like the school run is a massive plus for me! We chose the Happy Stars print however the Hug currently comes in 3 other different designs in the iconic, bright, child friendly prints we know and love from Cosatto. headband isn't out of place! 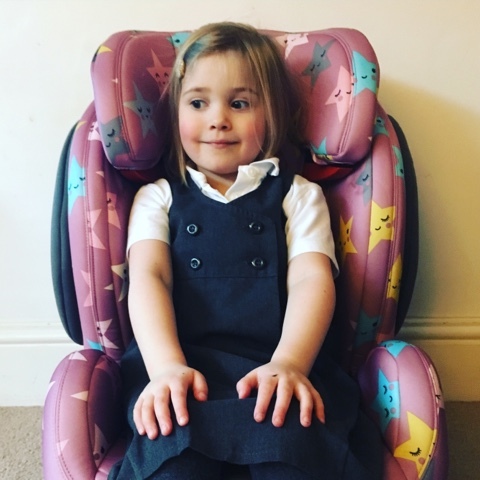 We would really recommend a Cosatto car seat and particularly the Hug as its such a great investment taking you and your child on a journey as you set out on your adventures together and as they grow. My only negative is that I could do with 3! You can take a look at Cosattos full range of products HERE. 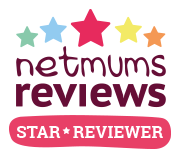 We were kindly gifted the car seat in exchange for an honest review. Its been an interesting week... very little sleep and no gas meaning no heating or hot water for 3 days but the little things and my little ones have made me smile this week. Working has been a challenge having been up a lot with Lottie in the night, my brain just wasn't functioning and all I could think about was how tired I was. 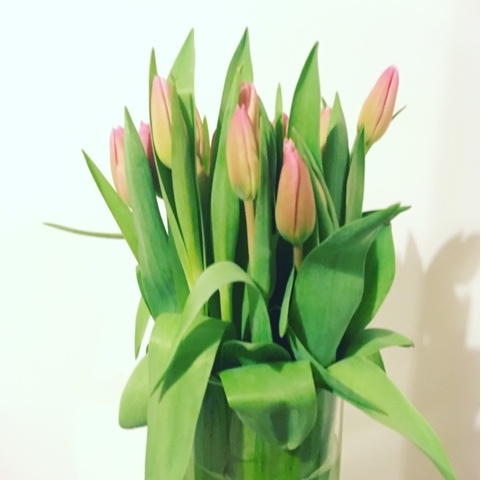 When I came home on Wednesday to fajitas on the table along with a bunch of tulips I could have cried, sometimes it really is the little things that mean such a lot, Oli definitely gets all the brownie points this week. 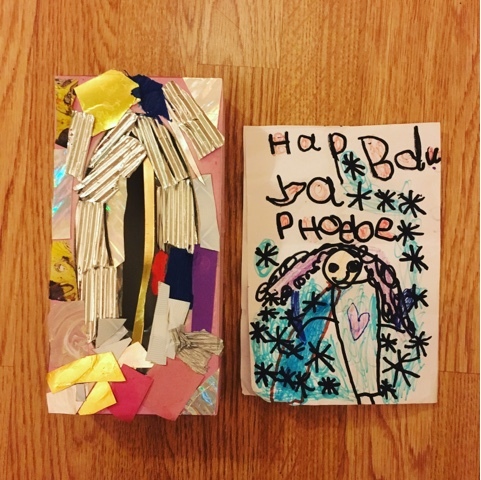 Phoebe turned 3 on Friday so we have been busy preparing for that including Ellie who came home from School one afternoon with a present she had made for her little sister. She kept it covered up and asked if I could let her in first when we got home from the school run so that she could hide it under her bed. Later on I managed to sneak a peek at it and it was the most beautiful homemade gift, a tissue box decorated with all things sparkly - two things that her little sister adores, squirrelling things away in boxes and anything shiny! I felt myself well up as she had clearly spent so much time on it and put a lot of thought into it and was so proud of it. She also made her an Elsa birthday card as Phoebe had requested an 'Elsa birthday' this year and wrote her name on it, something she couldn't do last year making it extra special. One of the things I strive to teach the girls is the joy of making others smile and being kind and thoughtful, it's lovely to see the little moments that reflect that it's working. On Friday after a family birthday breakfast of chocolate pancakes as requested by the birthday girl we dropped Ellie at school, Lottie with Nana and took Phoebe for a birthday treat to bounce on trampolines. I can't remember the last time she had both Oli and I all to herself but its safe to say she absolutely loved it as she held both our hands skipping into the trampoline centre. It was so fun to bounce together and spend some time one on one with her, this little moment meant such a lot to our little lady. Having collected her sisters we ended the day with pizza and ice cream at out local Italian as a family. Miss Tibs and I ready to bounce! Today we had a little party for Phoebe with a few of her friends and her cousins. She had asked for a Frozen party so I did my best with a frozen themed number 3 cake, blue jellies, snowflake balloons and sweetie cones. Her little face was adorable, this is the first year she has really understood birthdays and she loved it. After all the birthday build up and excitement this week I am looking forward to a fairly simple week ahead. I'm hoping to sign up to a yoga class to schedule in a little bit of down time and something thats just for me as the weeks can feel like a bit of a whirlwind at the moment and I know that I need to slow down and breath. Crossing all my fingers for a little more sleep this week too - I can but dream! It feels like you have been 3 for ages, probably because you have been telling everyone you are for months now! Your much awaited and anticipated birthday is here my darling and I hope it is as special as you are. 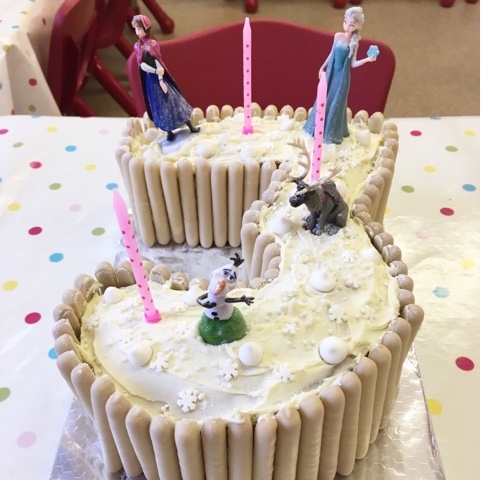 You and your big sister Boo have been planning every detail from a stack of pancakes with candles and chocolate sauce for breakfast to your Elsa, Anna and Aurora birthday cake mashup... I must admit I have had to reign you in and we have limited the cake to Frozen this year with a promise of Sleeping beauty next year. This is just one of the things we love about you, you know your own mind like no one else I know, fiercely independent you make your wishes known that is for sure. You are a happy little bright light that makes us all smile, there is fire in your eyes that sparkles and glints and its truly infectious. Your sparkle is only increased by the amount of play jewellery you wear at any given time, I quite often find you with arms covered in bracelets, 6 necklaces and a ring on every finger. You love raiding my jewellery box and squirrel away any treasures you might find like a little magpie. 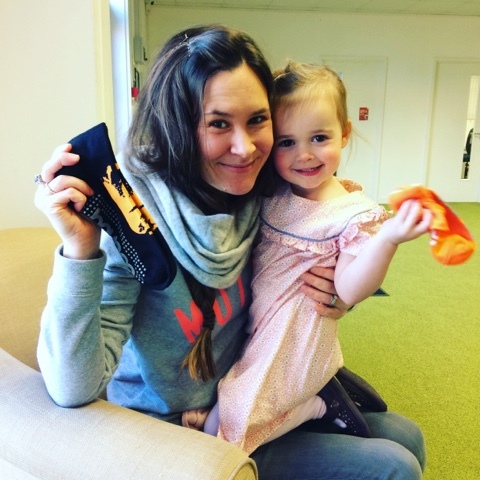 You are currently not a fan of clothes and although a January baby I think you would have been far more suited to a summer birthday as you love bare feet, bare legs and a wearing just a t shirt and leggings. You like to choose your own clothes in the mornings and have quite specific requirements when getting dressed. A dress will only be worn if for example it passes the twirl test, you are not a fan of layers so cardigans, coats and hats are often dismissed but I carry them around with us anyway so people don't think we are bad parents! The only time I have seen you willingly put on a coat without a bit of negotiation was last week when you saw your first snowfall. You had been dancing around the kitchen in your Elsa dress to 'let it go' as the snow starting coming down, you truly thought you had made it snow which was so sweet that I didn't correct you. You epitomise the magic of childhood Tibs, you show such wonder and excitement at things and have such enthusiasm to explore the world around you. You love to sing and dance, you love watching Topsy and Tim and surprise egg opening videos on you tube, you love to pick the same book at bedtime for 3 weeks running (we are currently on 'kitchen disco') you love carrying around all the play food in shopping bags, you love scooting and climbing and playing with your sisters, you absolutely love babycinnos but they must have marshmallows. You still love anything with a big bad wolf in and often ask if he's coming to our house, you love coins and money - maybe you'll end up being some kind of investment banker, i'm documenting this in case you are! 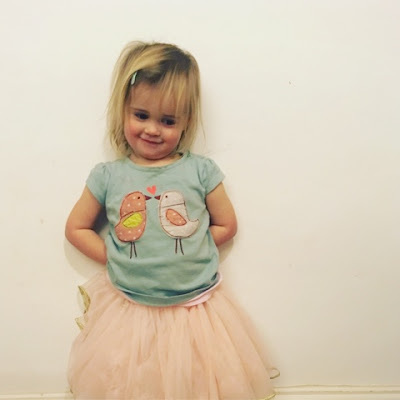 You are a little adventurer and love getting mucky and muddy and sticky yet in equal measure you love having your fingernails painted, your hair plaited 'like Elsa' and prancing around in princess dresses. You also love and are very good at being cheeky, you're the little entertainer of the family and enjoy making us all giggle, Dot thinks you are particularly hilarious at the moment which you love. You are super loving and insist on kissing each sister goodnight each night and quite often climb up onto my knee and throw your arms around me. You have settled in brilliantly to play school and have made some lovely friends all of your own there, its been wonderful to see you grow in confidence and as I drop you off there and you pop your name in the postbox and saunter off waving over your shoulder I feel incredibly proud of you. There is a particular quote that always makes me think of you from Shakespeare's A Midsummers Night Dream - "though she be little she is fierce" - you are such a dinky little dot, perfect in every way and that fierceness and determination in you will stand you in good stead, hold onto that my darling and use it wisely. Today we are going to go and bounce together on trampolines because that is what you'd like to do on your birthday - i can't think of a better way to celebrate you little lady and hope you have the best day ever. 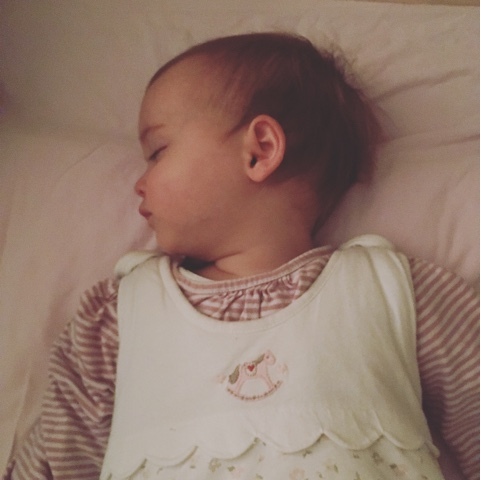 I started this blog 14 months ago to record our lives and capture the little ladies in time, because whilst the days are long sometimes with little ones, the years are definitely short and they seem to grow up before my very eyes. Sometimes the focus can be on the milestones and the big things which need to be documented and rightly so. However, sometimes it's the ordinary moments that need documenting as they are the ones I'm more likely to forget, or I'm sad to say, the ones I don't always notice because life can be so busy that sometimes they just pass me by. 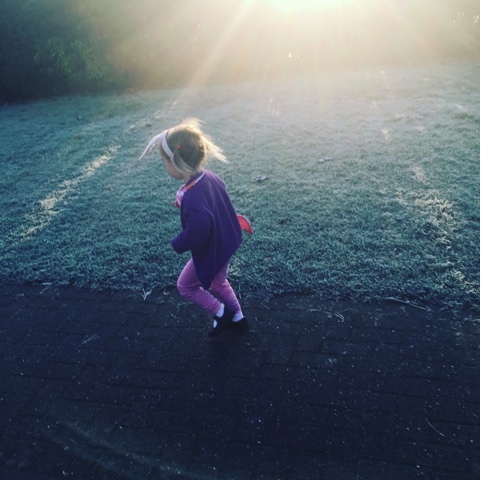 Along with our monthly Me and Mine and Siblings Projects posts I've decided to join in with one final project this year called The Ordinary Moments run by Katie over at Mummy Daddy Me and Donna from What The Redhead Said. I have missed the first week but I will be sharing some thoughts here every Sunday this year to document those ordinary moments, which are actually often incredibly special moments, the key is taking notice of them. Here are last weeks ordinary, but magical moments that I am so glad I captured. I love this photo of Phoebe and Ellie. 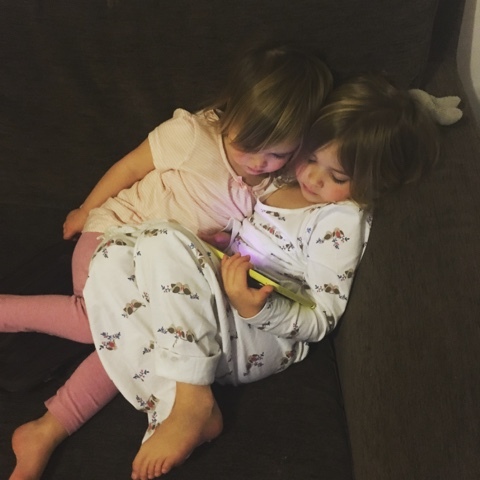 I know they are watching the iPad but look how snuggled together they are! I came into the living room after clearing up the breakfast things to get them ready for play school and school. I actually couldn't bring myself to interrupt them so I took a photo of them instead and busied myself with all the other things that needed to be organised before finally prising them apart and getting them dressed. Before I started my job in November, I might not have noticed this moment, I worry that caught up in the everyday I missed things, maybe I didn't, but I feel like I notice and treasure them so much more recently. There's so much to be said for slowing down, watching and taking it all in. By consciously making more of an effort to do that I have learnt so much about my children this week. Listening in to their little conversations and imaginations is really beautiful. I took this photo of Ellie and Phoebe last week at 7:30pm when they should have been in bed asleep. They were playing and chatting so nicely in their little reading nook about whether or not Rapunzel should buy a dog, so I just sat against one of their beds and watched them. It made all the tough parts of the day feel so worth it, the school run rush in the rain, dinners refused and pushed across the table, battles to brush teeth, none of it mattered right then. A perfectly ordinary moment, but there is magic in ordinary and I'll be taking notice of that magic more and I hope you'll enjoy sharing these moments with us. 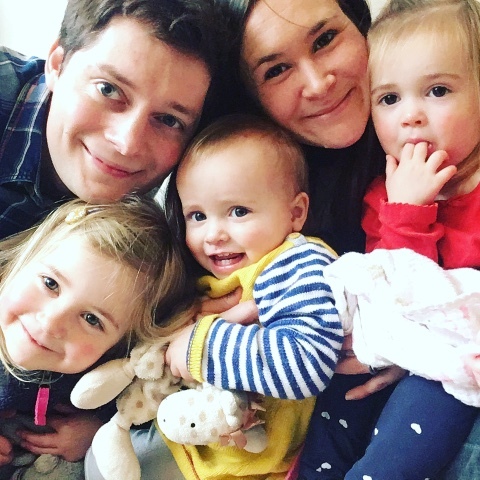 Family time is so important to us, with Oli working quite a few weekends our time together is really precious so we do our absolute best to do something fun together. 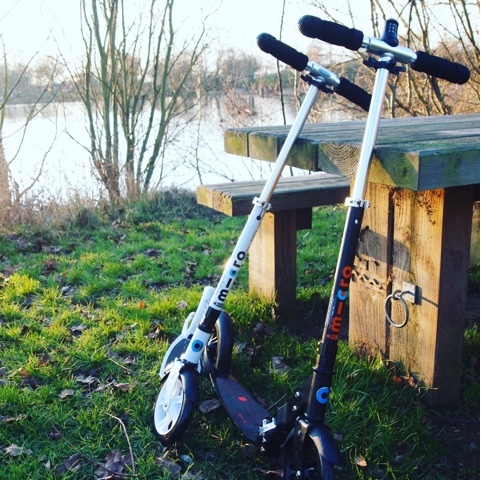 We love to get outside, explore and have an adventure, this weekend we did just that, with a little help from Micro Scooter. Micro Scooter have a scooter for every single member of the family meaning mums and dads can get out and have some fun together with their children. It was something I had never considered doing but it was so much fun and really is the perfect way to spend some time together as a family. 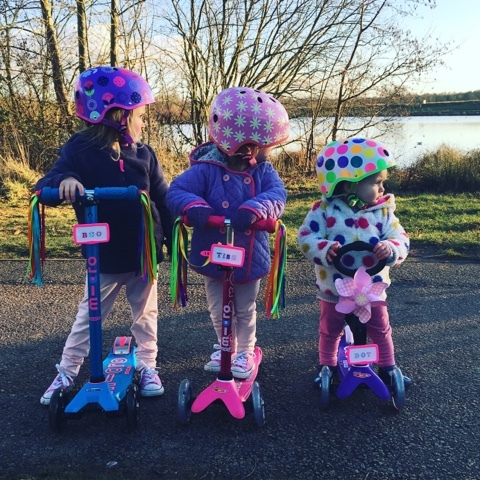 Wrapped up warm and helmets on we went to our local country park and scooted around together, the little ladies loved that Oli and I were scooting alongside them and it made such a pleasant change from running behind them. I can totally see why they love scooting, the wind in your face as you whizz down the path is a brilliant feeling and took me back to my childhood. 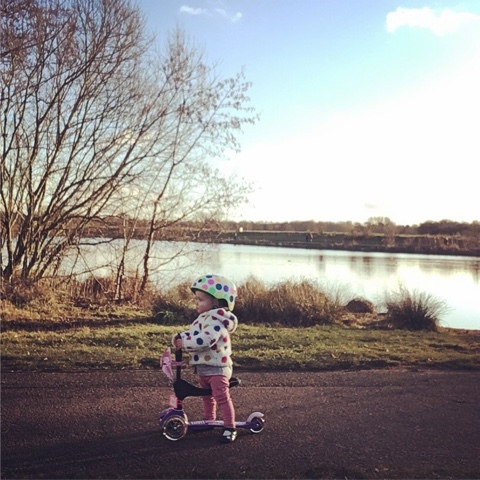 We were able to explore much more of the country park than we would have by foot giving us such as sense of freedom and it was something that everyone enjoyed and could take at their own pace - even little Miss Dot. The range that micro scooter offer is fantastic and the quality of the scooters themselves and the accessories is second to none. 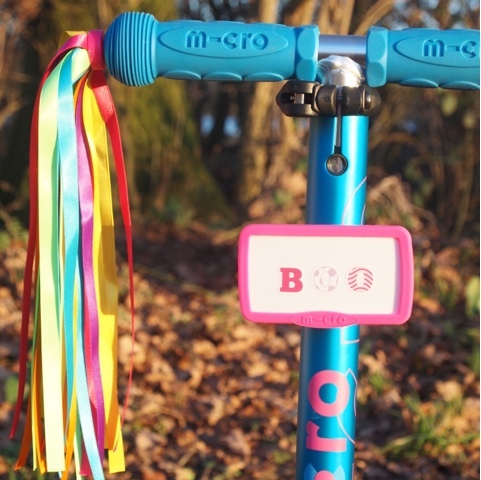 They are sturdy, lightweight, super easy to steer and look brilliant with their bright iconic design, especially as they can be customised with a great range of accessories - we love the ribbons, windmills and helmets in particular. The girls scooted back and forth for ages and loved navigating the little bridges and seeing how fast they could go. 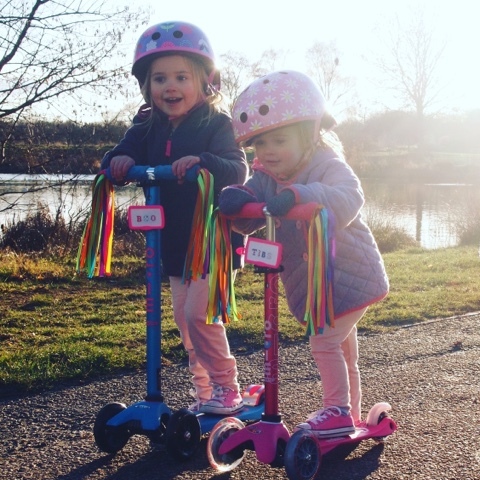 The two wheels at the front mean that it doesn't topple over and that it is reactive to the direction you lean and steer meaning that Miss Tibs and Miss Boo age almost 3 and 5 are able to confidently and safely whizz around with ease. The break is also easy for them to learn to use should they need to slow down to navigate turns, hills or other people on the path. One of the things I love about having such a close age gap is that the girls often share the same interests, Miss Dot is so keen to follow in her sisters footsteps and is such a determined little soul. I'm so pleased that because Micro Scooter have thought of everything she was able to join in with our little adventure. 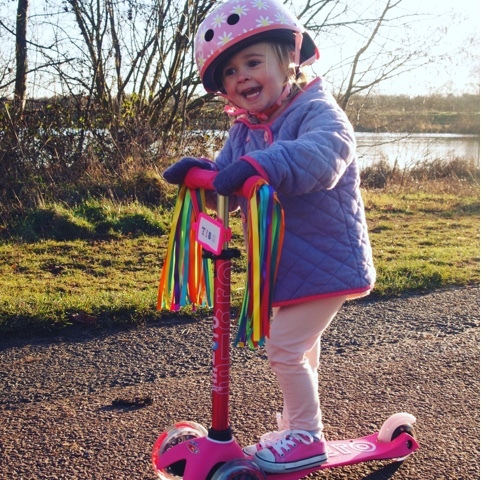 Although only 17 months she is learning to scoot on her Mini Micro 3 in 1 Deluxe Scooter which is absolutely perfect for her to get started on. It comes with a little seat for her to sit and balance on like a ride on and a more toddler friendly handle. 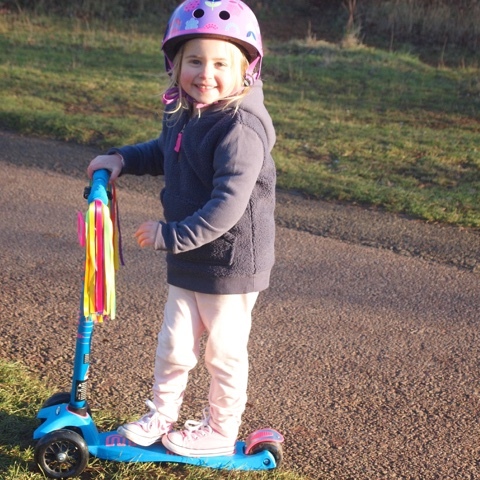 These can later be removed and changed to a standard scooter handle bar which comes as part of the set, so it is something that can really grow with her as she gets to grips with scooting and gets older as it's suitable from age 1 - 5. 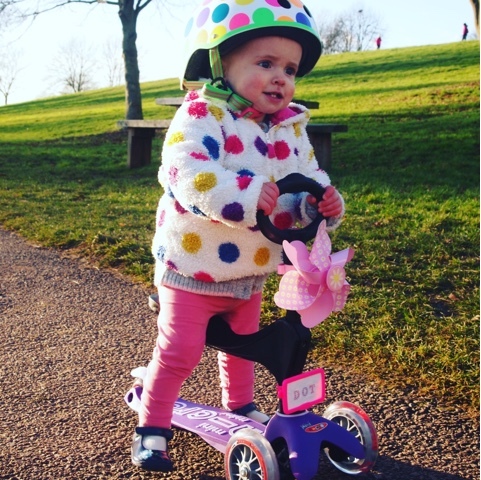 We bought Miss Boo a Micro Scooter for her 3rd birthday and pretty much as soon as she could walk Miss Tib's has been desperate to scoot like her big sister. They have been really good about taking turns on it and sharing it but it was so lovely to see them scooting along together having a little race. Miss Tib's was in her absolute element. She is now the proud owner of her very own Mini Micro Deluxe Scooter complete with ribbons and a name plate and couldn't be happier with it. The handlebar is adjustable so will grow with her and with the scooter designed for 2-5 year olds it's a great investment, especially as she is quite tiny so I wouldn't be surprised if it lasts her well beyond this. The joy on her face is so lovely to see and I think we'll be scooting anywhere we can if she has her way! Miss Boo's first scooter was a Mini Micro Original Scooter and has been absolutely fantastic. However she seems to have had a bit of an overnight growth spurt and shot up all of a sudden. She was over the moon to move up to the next stage to a Maxi Micro Deluxe Scooter aimed at children between 6-12 years old, but with a 70kg weight limit I think it's safe to say it will last her as long as she wants to scoot! 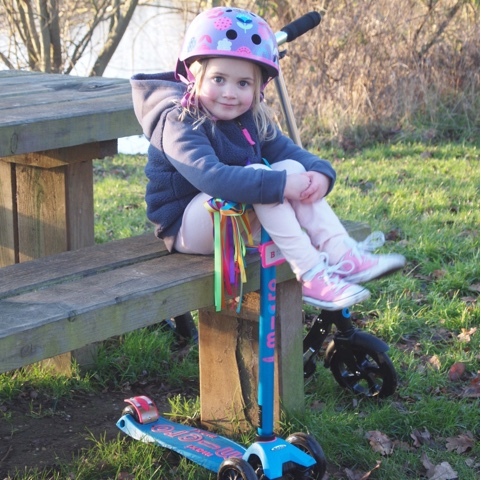 She is delighted that she now has some scooting buddies to join her on her adventures and is already planning scooting expeditions into town for a milkshake with mummy or daddy. It must make a lovely change for her from me running behind her with the double buggy, fun is so much more fun when you're sharing it with others isn't it? 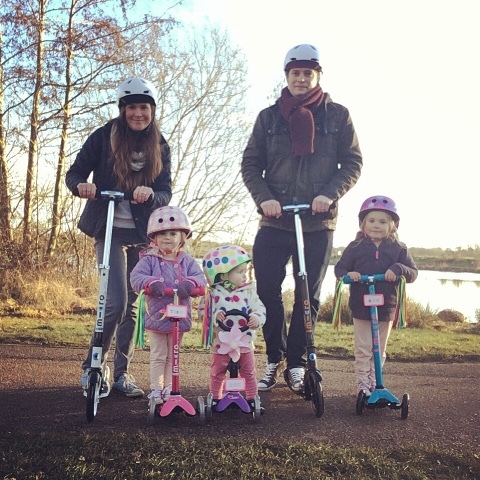 Scooting is absolutely not just for children and really is something the whole family can engage with. 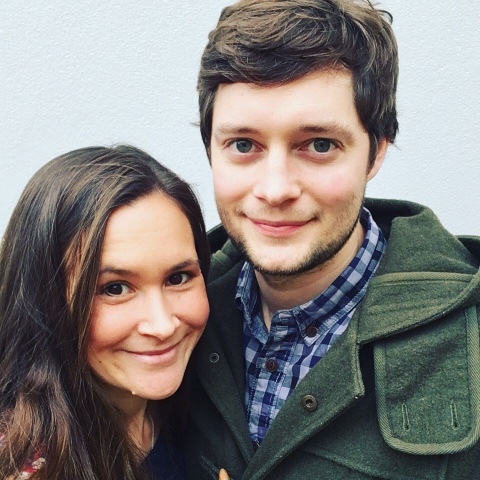 Oli and I were really surprised how much we loved it and as well as being a fun way to spend time with our children it's also great exercise. Being active is something that is really important to us as a family, being fit and healthy means we can keep up with the children and encourage them to exercise too. I was amazed at what great exercise scooting is and to learn that Micro Scooter have created a simple easy to follow fitness programme called Scootercise which you can just intergrate in to any journey you make on your scooter and that a brisk 10 minute scoot could burn off 160 calories - perfect for the school run! The adult micro scooters fold down in half and the handle bars retract making it something that is really portable and practical to use. Oli's came with an integrated lock so he's planning on taking it on the train with him as part of his commute to London which will save him time on his 20 minute walk to work from the station once he is there. The fact that it's so compact and lightweight makes it easy to transport and they are an absolute joy to ride. I thought I might feel self conscious but I really didn't and we had lots of compliments about how lovely it was to see the whole family out and about on scooters. 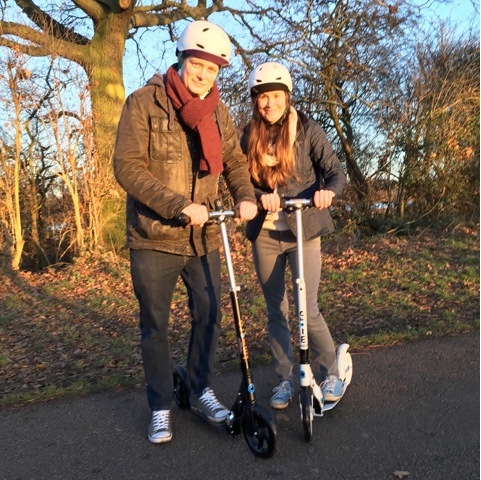 We absolutely loved our family adventure together and would really recommend Micro Scooters for everyone in the family, we can't wait to take ours out again. PS Don't forget to Scoot Safe when out and about on your own adventures. We absolutely loved being a part of the Me and Mine Project last year where we capture and share a family photograph each month of all five of us. This year we are going to join in with the Siblings Project where on the 15th of each month I'll share some photos and some observations of my little set of sisters to document them and their relationships with each other. I take so many pictures of the girls (I think my phone has over 8,000 on! ), it has fast become one of my favourite things to do, capturing them in time, freeze framing a moment to remember. My favourite photographs are always when all 3 of them are in the frame. When they are altogether in a line, in a pile, having a cuddle or doing their own thing I feel like their personalities shine through, that their bonds with each other are visible and I can see all their similarities as well as their differences. I love how they change as they grow, the fun they have and that they have each other to share their childhood with. 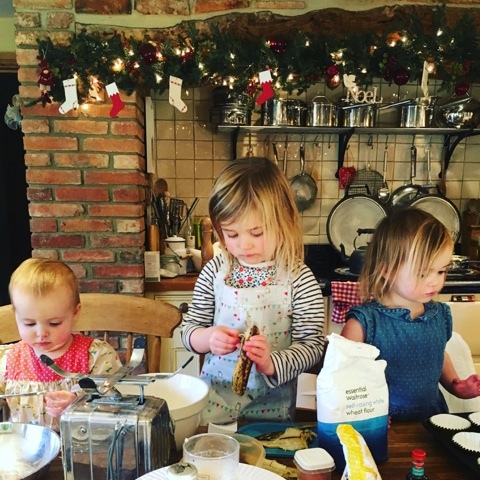 I love this photo of the little ladies baking banana muffins just before the school term started at the beginning of the month. We had such a lovely time over the Christmas holidays as a family 'just being' and I just loved having them altogether. They adore baking and are all keen to get involved. Miss Boo is a little mummy and keeps the little ones in check. She's great at following instructions and really enjoys the magic that happens when you mix all the ingredients together and the finished product comes out the oven. Miss Tibs will take any opportunity she can to lick the spoon or to 'check' the sugar is OK. She loves cutting shapes out of biscuit dough and lining up the cake cases in the tray. Miss Dot although only 17 months is so keen to join in with her big sisters and has to be the same as them, she loves eating the fruits of our labour most. The little ladies often operate as a pack, particularly when they are being cheeky. 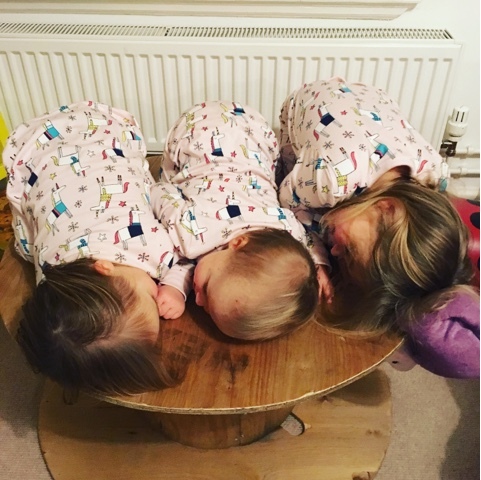 They were so excitable in this photo here all snuggled up in a pile in they matching pj's on the coffee table, giggling away, pretending to be asleep. They have so much fun together and love each other dearly and this was one of those lovely moments I just had to capture. Don't get me wrong, there is plenty of hair pulling and pouting and fallings out but this is quickly forgotten with a cuddle. I love having a close age gap for many reasons - being able to dress them in matching clothes is just one of them! I took this photo during the first week back at school when everything felt a bit hectic and stressful and when I was feeling a little sad about going back to work after such lovely time with them over the holidays. I took it to remind me that amongst the chaos and stress there is much happiness and that at the end of the day that it's all totally worth it, because it's all for them. Miss Boo is still bringing her bunnies along for the car ride to school, she has had them since she was 6 months old and they are such a comfort to her. 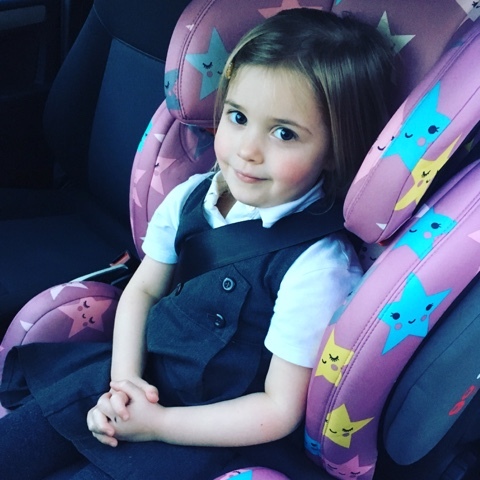 I was a bit concerned about how she would be going back to school as we had quite a tough first term with tears in the morning at drop off. It was a huge relief when she skipped in happily and has done everyday since. It just goes to show that they all do things in their own time, when they are ready. I love this photo because Miss Tibs insisted on wearing her fairy costume to play school and I didn't have the energy to fight her as I had been up for the third night running with a teething Miss Dot. When I look at her face here and see the joy it bought her it reminds me to pick my battles and most important of all, to let them be little. Miss Dot, despite having thrown an all night party looks surprisingly bright here, she is such a happy soul and really does just fit in and go with the flow so I will forgive her for pinching my side of the bed so often and actually when she doesn't want cuddling in the night anymore I am very sure I will miss it with all my heart. 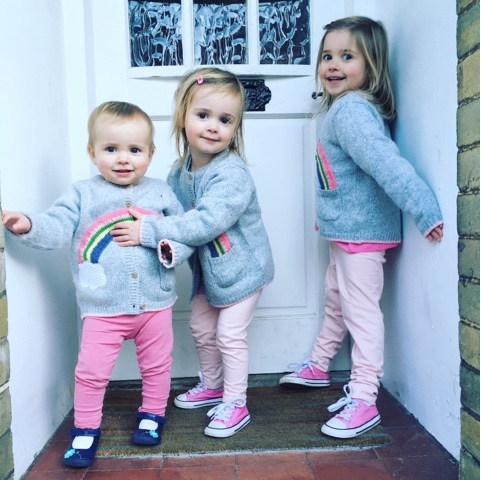 This is my favourite photo of the girls this month, not only because I am in love with their cardigans (which are from Next by the way!) or because they are all looking at the camera, but because I can see the excitement in Miss Boo's eyes about going to test out her new scooter, because Miss Tibs is gently holding her little sister to stop her jumping off the doorstep and most of all because they all look so happy which makes my heart happy the point it feels like it could absolutely burst with love for them. Now that I'm back at work 4 days a week I really appreciate my time off with them and weekends have become weekends again rather than just another day of the week. 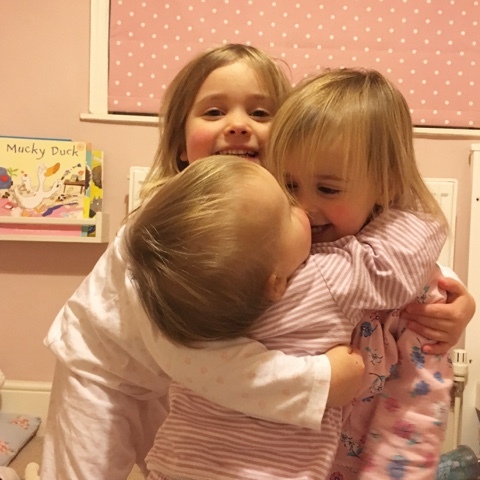 I hope you enjoy our little siblings updates each month, I thought it would be a lovely opportunity for you to get to know the girls a little more and document our days. Make sure you check in on the 15th for next months update. We have accumulated far too much 'stuff' and this year slowly but surely I am determined that we are going to have a clear out, giving us some much needed space and then be smarter with our storage. We have had a toy clear out and organised the playroom old clothes and piles of paper are next... before tackling the airing cupboard and under the beds... I'm aiming for one clutter clearing activity a month. Oli and I haven't had much time together recently but I've decided we are going to make an effort to go out together at least once a month whether its for a drink, to the cinema or for dinner and the ultimate goal is a night away for some much needed sleep and a lie in! I'd like to give the whole house a lick of paint over the course of the year. We have lived in the house for 6 years now and it's definitely due one. Priorities are the kitchen, the hallway and the living rooms. We spend so much time in the garden in the Spring and Summer so I'd love to get garden ready with some new outdoor furniture, a playhouse for the girls and by replacing a fence panel or two. These are little luxuries that we haven't been able to consider while I haven't been working but things that will make it all feel worthwhile and more than ever make our house a home. 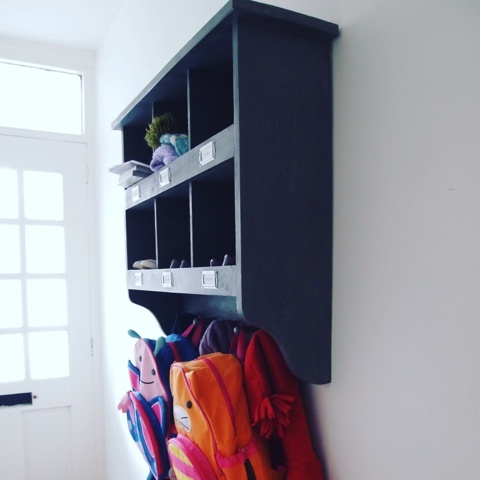 The addition of our hall wall unit made such positive change to our home in 2016 in helping us get organised as we leave the house so smart storage is also high on the agenda. 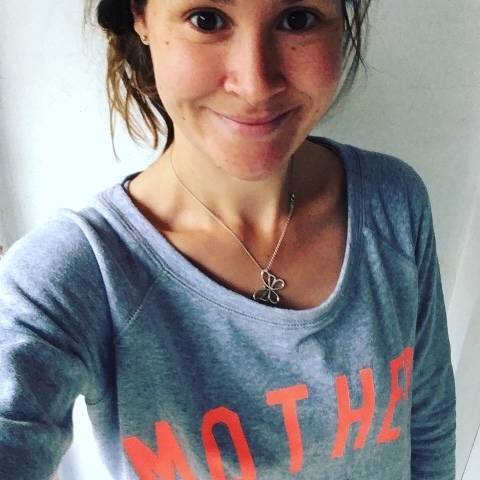 A cliche, but I have come bottom of the pile for a long time and last year I realised in order to be the mother, wife, friend and daughter I want to be I have to look after myself. That means time out, time to myself as well as fitness and eating well. I have survived on coffee and not much else for too long! I'm starting this by drinking more water and finding a yoga or Pilate's class to sign up to. I've realised that I can be a better mother and all the other things I want to be if I look after me better. This is only last because it's something we already do quite well, but I want to make sure we schedule in dedicated time together just the 5 of us. We have booked a little holiday for May to a tree house in Somerset for 7 days of just being us. We will also renew our National Trust membership because there is nothing we love more than exploring new places or going on an adventure together. I also want to make sure that I schedule in one on one time with each of the girls, such treasured moments when we get them and I think hugely important. I absolutely loved being a part of the Me and Mine project this year and this is something we'll continue to do each month in 2017 to document our memories. I'm really excited for 2017, a year of 'just being' I think and enjoying the simple things in life. Have you set yourself some goals for the year ahead? I'd love to hear them if you have, leave me a comment below. Last year we converted what used to be an office in our home into a Playroom for the girls. 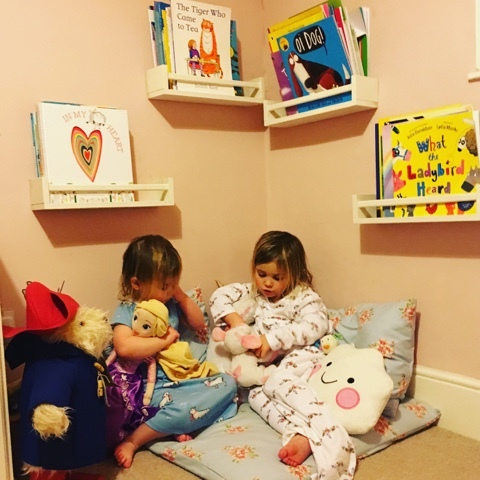 Overrun with toys and with nowhere really to put them I was keen to create a fun yet functional space for the little ladies to play in and regain some of the adult space in our home. I wanted it to be a room they loved, but one we loved too. Play and letting children be children is so important to me and something I am really passionate about, creating a space for them to do just that in was a really enjoyable DIY project. I looked at the toys we had and designed the areas around them as well thinking about the things the girls enjoy like art (more on that later). 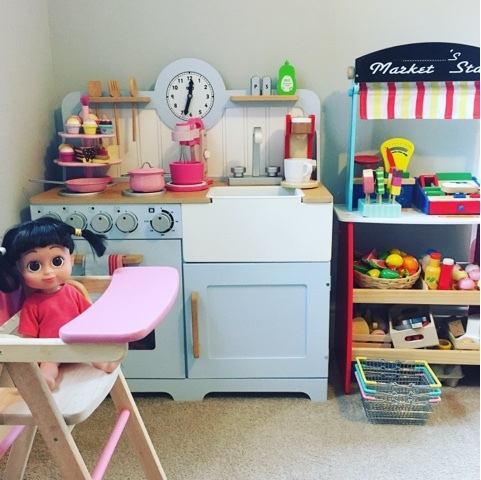 Our play kitchen, shop and dolls pram, bed and highchair are perfect for a 'home corner' and are some of the most played with toys we own. The girls are continually filling their shopping baskets, tending to their babies, cooking and making each other cups of tea or baking pretend cakes and when friends come to play it's a wonderful area for everyone to play alongside each other, make believe and let their imaginations flow. 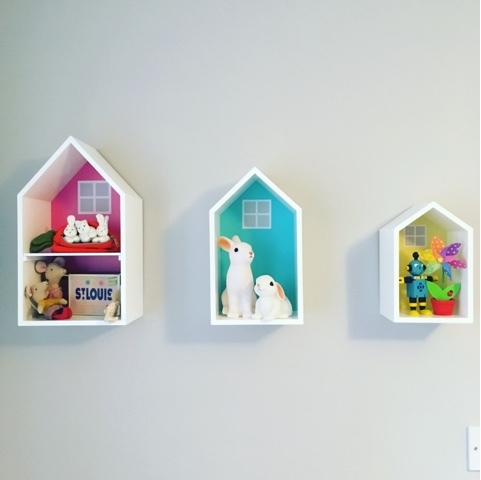 These Townhouse Shelving units from the Great Little Trading Co sit on the wall above the play kitchen to denote it as the 'Home Corner' and are fab for displaying cute little things like our Maileg mice and woodland bunnies. 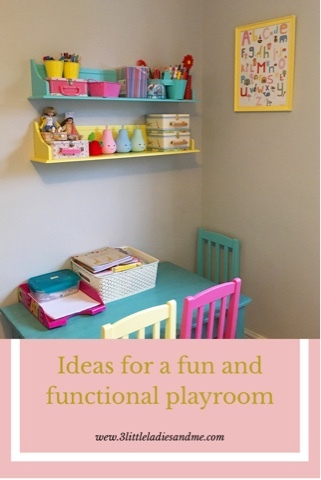 They also provided the inspiration for the playroom colour scheme and are one of my favourite parts of the room. 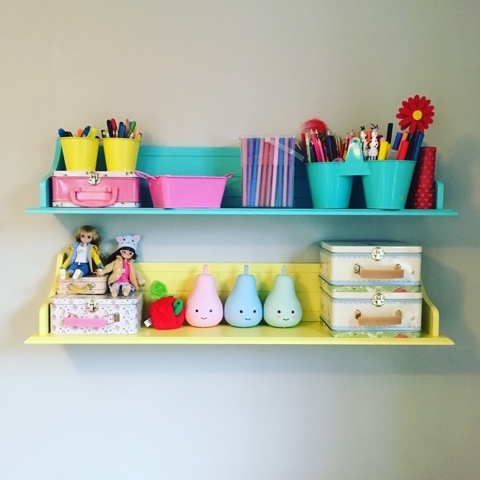 Having found the inspiration for the playroom colour scheme in the Townhouse shelves we went for a grey base on the walls with injections of pink, yellow and turquoise in the furnishings and accessories. The paint we used is 'Light Rain' Silk from the B&Q Colours range and has a great finish. I think these colours work really well together with the bright colours really standing out against the grey and complimenting each other well. One of the things I really wanted was for the room to be bright and cheerful, not too pink (which I am quite conscious of with a houseful of girls) but also practical and the grey paint is wonderful for disguising mucky little hand prints as well as giving a contemporary feel. Choosing a set colour scheme meant that we were able to tie everything else in the room together with real focus and consistency. The little ladies love creating, whether it's colouring, sticking, drawing or painting, it's something they do every day. Previously these activities took place at the kitchen table and I found myself constantly having to get things out for them and then having to stop their creativity to clear the table at mealtimes. 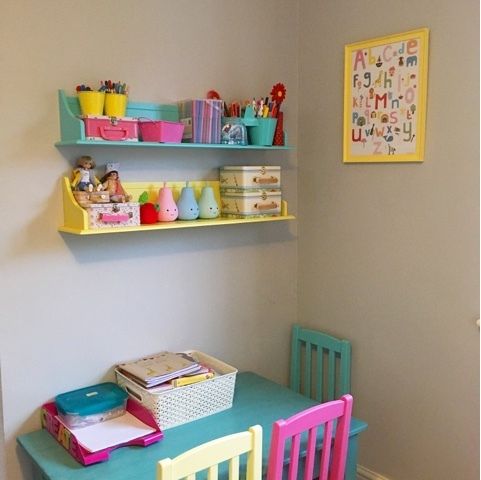 With this in mind I was really keen to include a 'Creation Station' in the playroom for the girls to access as and when they want to. This table in this corner of the room gets so much use whether its for something creative, homework, building Lego or as a cafe table to the neighbouring home corner. It was an old coffee table that belonged to my parents which we painted in Annie Sloan 'Provence' chalk paint to tie in with the colour scheme. There is a tray of paper so they can help themselves and whilst the pens and crayons are stored on the shelves when we tidy up at the end of the day they are otherwise down on the table for them to freely access. With 3 chairs there is space for everyone and we have one in each colour. The shelves above it also store little trinkets and treasures and elements to add a little fun like our glowing pear lights which are lovely on a dark Winter afternoon. Tins from Belle and Boo. The Playroom is accessed through an archway from our living room and as a result there is no door to shut and ignore the mess at the end of a day's play. Our main bathroom is downstairs and is also accessed via a door within the playroom meaning it is also a bit of a thoroughfare. I wanted to make sure that at the end of the day everything could be quickly and easily tidied away and that the girls were able to help with this. 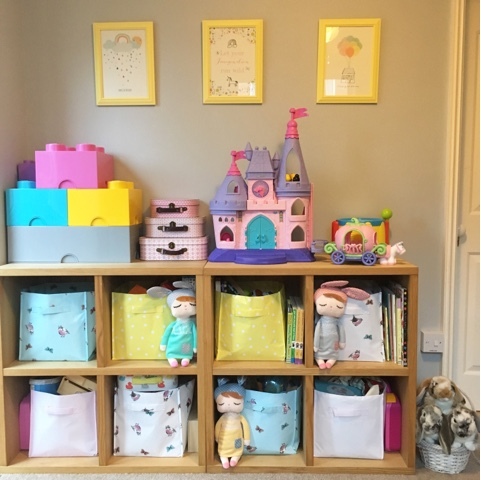 We already had two square shelving units from Ikea which we converted into toy storage with simple canvas box bags from H&M as they matched our colour scheme perfectly. Functionality is key with a playroom for me and the girls can easily take these boxes out from the shelving units themselves to play with things. The fact that they are open at the top means they can see what's inside; we keep the same things in each box and put them back in the same compartment so the girls know exactly where everything is. The boxes house things like Duplo, musical instruments, make believe sets like doctors kits, pets and Playmobil. 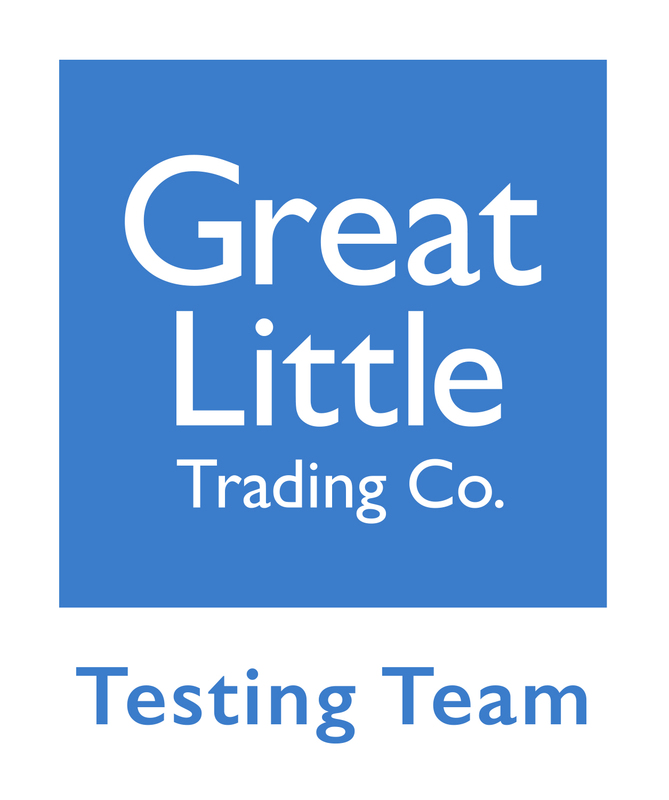 Lego is stored out of reach of the youngest two who are still tempted to pop it in their mouths on top of the units in giant Lego bricks which are available in every colour you can think of in a variety of sizes, we got ours from I Want One Of Those. Sass Belle suitcase hide all manner of things the girls like to collect from Schleich animals, to Palace Pets and My Little Ponies. We also have picture books on the shelves and windowsill for them to grab at anytime with a focus on colours, letters, numbers, shapes, animals and nursery rhymes. They have a dedicated reading corner in their bedrooms which I'm hoping to include in a separate post soon. As with any room in your home finishing touches are what make a room special. 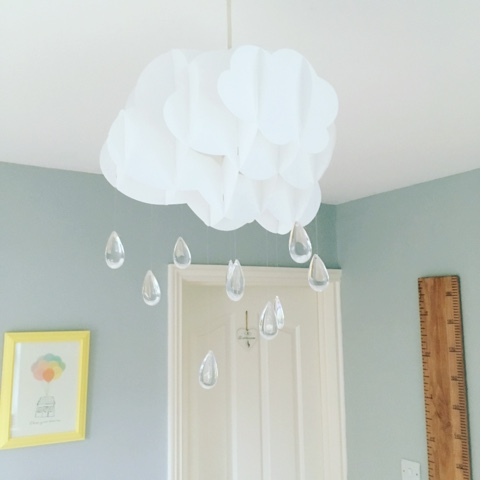 I wanted to add a bit of magic and personality to the room and so chose a feature cloud light fixture complete with little raindrops which the girls just love from Iconic Lights. I love that even on a grey rainy day when we are forced to play inside it is a fun and cheerful place to play in. 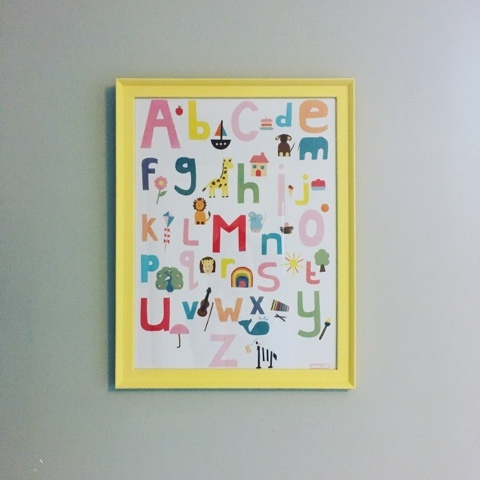 The prints above the toy storage are little motto's to inspire the girls which we framed in pine frames painted with a yellow tester pot to tie in with the theme. They say 'dance in the rain', 'let your imagination run wild' and 'chase your dreams'. We also have a full size ruler height chart from The Real Ruler Height Chart Company which the girls love measuring themselves and each other against. I hope that this is a room that will grow with them and as they get older and it becomes a homework space or somewhere for them to watch TV, read or relax with their friends. The ruler will remain a permanent fixture in the room to remind me that they were once small. Along side the ruler is a little bit of magic in the form of a fairy door from The Magic Door Store, a little touch to spark the girl's imaginations and for the tooth fairy and friends to visit of course. 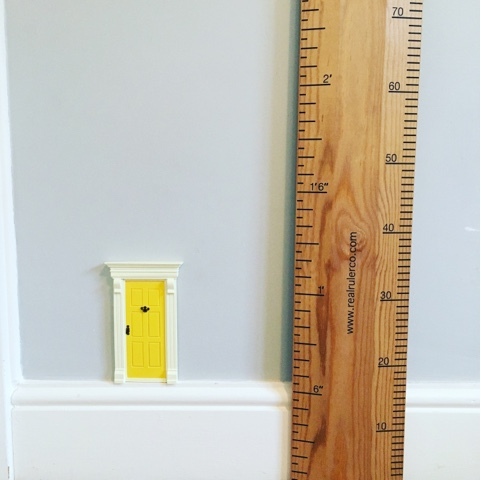 Fairy Door from The Magic Door Store, Ruler from The Real Ruler Height Chart Co. The girls adore their playroom and spend hours in it playing, imagining and creating. It is everything I wanted it to be and more; a truly fun and functional space which we all love. Like this post? Why not Pin it to Pinterest for later?